Dominika Cibulkova couldn’t match the power of her opponent at the Wimbledon Championships on Tuesday. Jelena Ostapenko fired a truckload of winners against the Slovakian in the women's quarterfinal, taking her down in straight sets 7-5, 6-4 on Court No. 1 at the All England Tennis Club in London. This is the first time the 21-year-old Latvian has made the semifinals at Wimbledon. Cibulkova had defeated Ostapenko before on grass, taking her down in straight sets at Eastbourne two years ago. With both strong on grass and neither having dropped a set, it was guaranteed to be a cracker of a contest. The match started with the two on deuce as Ostapenko denied Cibulkova a clean hold. The Latvian then hit a stretched out crosscourt winner before lobbing the next point away from Cibulkova for the break. The Slovakian came roaring back though, getting the break in the second game before holding for a 2-1 lead. She then added a second break, taking a two-game advantage over the 12th seed. The 29-year-old put up a fierce stance on the court, responding very well on the returns before nailing down the winners; she had Ostapenko running around the court at times. But the 12th seed clawed back, avoiding giving up a double break and then breaking back before nailing down the service hold in the sixth. The winners were starting to come together for Ostapenko, who looked for her chance to control the set. While she didn’t get the break in the seventh, holding serve kept her in touch with Cibulkova who was clearly hard to subdue. The Slovakian stayed in the hunt for the set but wasn’t getting much leeway as the Latvian constantly shot winners out of her reach. Ostapenko's offense finally paid off as she broke Cibulkova in the 11th game before putting it all together with a hold to love to take the set 7-5 in 45 minutes. While her serve wasn’t at the level that she would have wanted, Ostapenko getting the lead was key to improving her second serve. She clearly had Cibulkova beaten on winners, scoring 23 to her four, but had more than twice the number of errors to limit the difference going into the second set. She then went a break up in the third game, but didn’t hold it for long as Cibulkova got it back in the fourth. Just when it looked like she had found her groove to get back into the set, Cibulkova dropped her serve giving Ostapenko another. A hold in the sixth game put the Latvian further out in front, with time running out for her opponent. To Cibulkova's credit she fought hard to avoid another break; she held serve with some aggressive play and got to within a game of Ostapenko, still holding a chance to save the match from going out of hand. But Ostapenko held firmly in the eighth, sealing a love hold with an ace for a chance to break the match. The 29-year-old, who didn’t have the speed of her opponent, struggled on serve with a double fault before getting on the board with a forehand error from the world number 12. Another errant forehand by Ostapenko ruined her chance to break for the win, which meant she needed to serve clean to prevent Cibulkova from having a shot at turning the set around. That's exactly what she did, as she hit three winners to earning three match points. She finally the match with a forceful forehand that ended the match in 1 hour and 21 minutes. Ostapenko finished with her game under control despite having 28 unforced errors. 32 winners and five aces balanced out her erroneous shots by a significant degree. 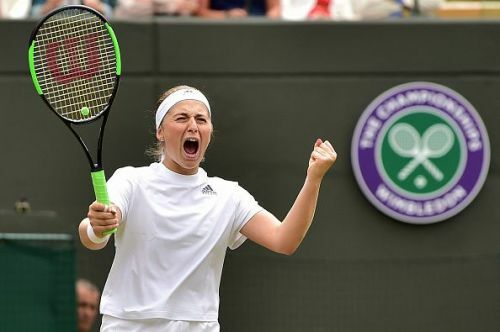 With only two more matches to go to become the third woman to win the girl’s and ladies titles at Wimbledon, Ostapenko will take on Angelique Kerber in Thursday’s semifinal match-up.